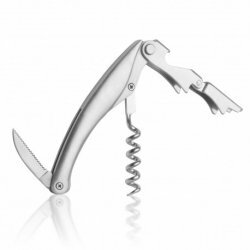 A lightweight and compact corkscrew for both restaurant staff and the everyday wine lover. A simple 2-step lever design, provides for easy cork removal with minimal effort. Also - designed into the corkscrew - a stainless steel serrated foil cutter and bottle cap opener. All designed and made with a lightweight aluminum body. This corkscrew is lightweight and easy to carry. Perfect for outdoor outings and get togethers.